Traditional document drafting has been proven to be inefficient and time-consuming. Thanks to Document Automation, drafting time is significantly reduced, documents used across an organisation are up-to-date and consistent, and everyone in your organisation becomes self-contracting. From the most simplistic to the more complex, all documents and document processes can be automated. 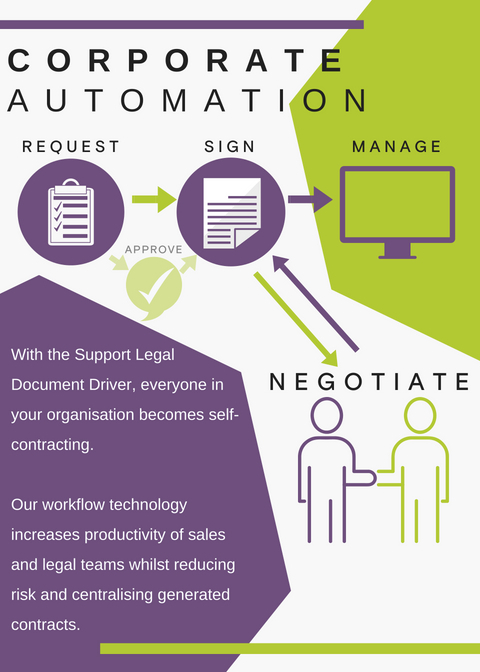 Support Legal offers the Document Driver as our Document Automation service. Document Driver has been developed on the most powerful and sophisticated automation platform in the industry. Not only are we able to offer clients automated documents, but we can also work closely with organisations to tackle workflow frustrations and automate the entire document creation process, including document review and signature workflows.